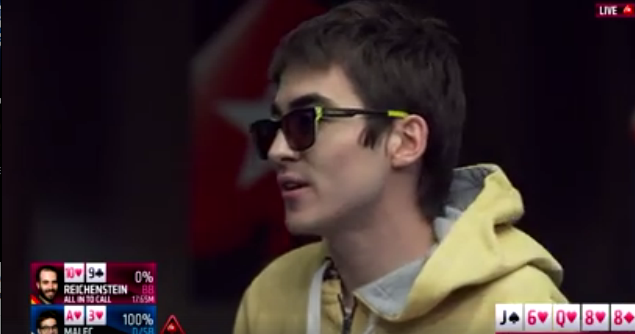 A young poker pro from Poland took a psychological trick out of Scotty Nguyen’s playbook during a heads-up battle in the PokerStars EPT Barcelona main event this past weekend. While holding the nut flush on a board reading Q J 6 8 8 , 21-year-old Sebastian Malec moved all in. His opponent, Uri Reichenstein, held the 10 9 , which was a straight, but perhaps could only beat bluffs. He had quickly checked to Malec on the river. The heads-up battle had been going on for over six hours. Malec’s bet put Reichenstein all in, and while the latter was contemplating the decision, Malec went over to the rail to take a selfie. He was talking nearly the entire time about what was in his opponent’s range and how the hand played out. At one point, Reichenstein said, “no one talks like you without having the nuts.” It was a pretty good read. “You call it’s all over baby, like Scotty Nguyen,” Malec said. The two were playing for the $1,258,210 top prize. More than $900,000 was to go to second. Reichenstein eventually went against his read and called, and it was in fact all over. Those words are still well-known nearly 20 years after Nguyen famously used them in the World Series of Poker main event to get Kevin McBride to call all in while just playing the board. Watch the final hand below. Below is Nguyen’s last hand in the 1998 main event.